Injured Fresno Fire Captain and local hero Pete Dern, who suffered burns to much of his body while fighting a fire in March, is now walking, and talking, and smiling! 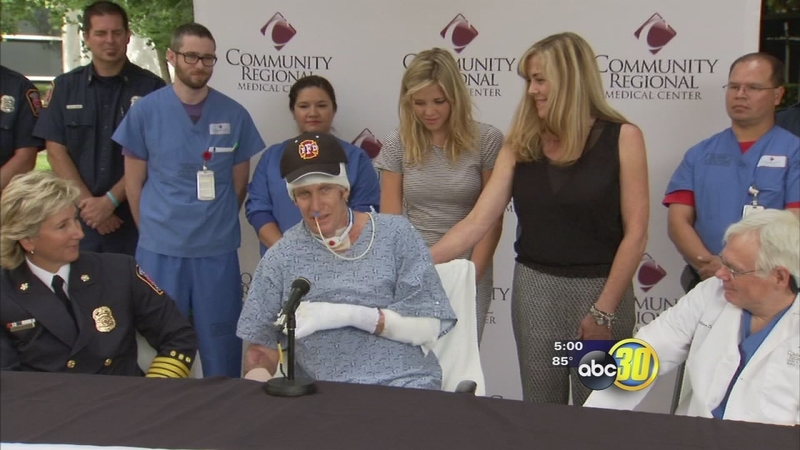 FRESNO, Calif. (KFSN) -- Injured Fresno Fire Captain and local hero Pete Dern, who suffered burns to much of his body while fighting a fire in March, is now walking, and talking, and smiling! He addressed the community Friday and gave thanks for all the support he's received over the past few months. 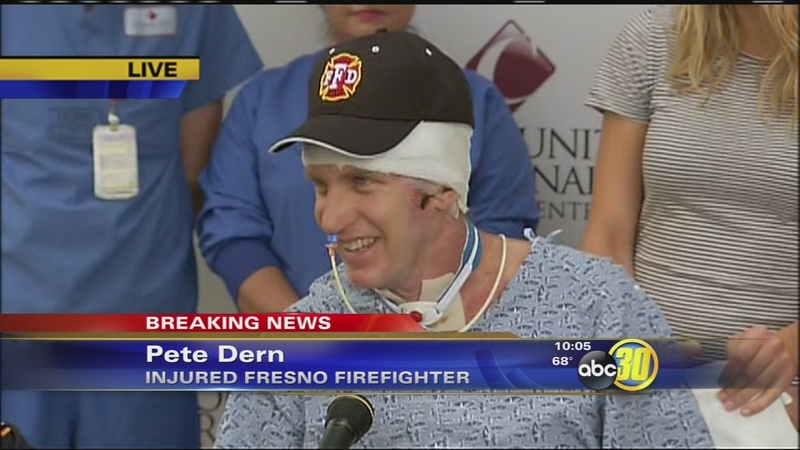 "Our community here in Fresno -- I want to thank everybody for their prayers and support," Dern said. "It really matters." Dern's remarkable journey and recovery have drawn national and international attention. And he took another big step forward Friday, letting us all know he's feeling good. 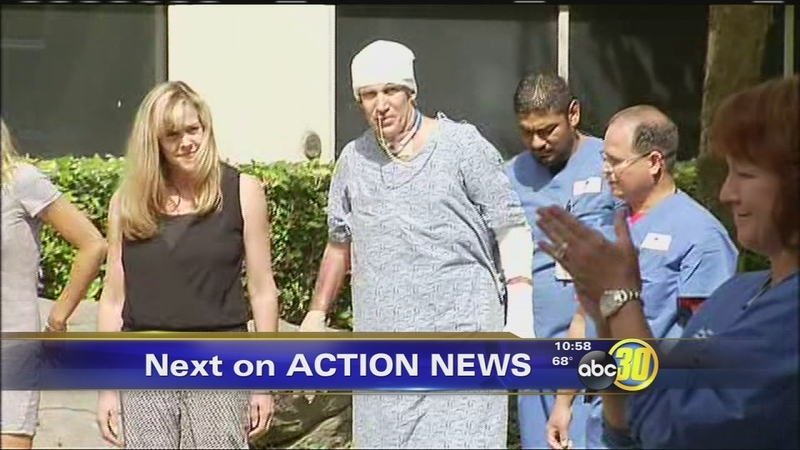 After months of recovering from serious burn injuries, Fresno Fire Captain Pete Dern walks to his press conference. It's hard to fathom how far Capt. Dern has come in about 100 days, but his strength and resolve were obvious as we watched him walk up to talk. His message was brief, but he knows how important it is to his fellow firefighters and fellow burn victims. Dern left his wheelchair behind and drew loud cheers. Despite the large crowd gathered to hear him speak, the fire captain gave himself an unassuming introduction. "Hi," he said. "I'm Pete Dern." Pete Dern, indeed, but who exactly is Pete Dern? The world has come to know him as the firefighter who fell into a burning Central Fresno home when the roof collapsed. He suffered burns to about 70 percent of his body, but survived. He's worked hard to reach this day and even his fellow firefighters are sometimes amazed by him. "This is an amazing man and I couldn't be more proud," said Fresno Fire Chief Kerri Donis. "This is a leader in our department." More than three months after a fiery roof collapse sent him to the ground, and then the hospital with severe burns, Fresno Fire Captain Pete Dern is ready to talk. Dern has also become a face for burn victims the world around. His hospital room is plastered with well wishes from all over and by making his struggle public, he's helped many people understand what survivors go through every day. "Pete is our hero, but he's not just our hero," said Sandra Yovino, who heads up the burn center at Community Regional Medical Center. "He's everyone's hero." But in the bigger picture, Dern is a husband and a father, and a man who wants to get home to be with his family. Friday, he thanked his family, his firefighting family, and the medical staff at Community Regional for all contributing to getting him here, on his own two feet. "It was a long road and I still have a pretty good amount of road to walk down still," Dern said. Doctors say he's had 19 surgeries and still has at least two or three more to go. If you would like to make a donation to the Leon S. Peters Burn Center, click here.